Casita Limon in Sayulita is a striking, artist-designed and -constructed home that sits on a beautifully landscaped hill only three blocks, five minutes walking, from the beach and plaza (town square.) A free-standing, fully-furnished home with terraced gardens, you will enjoy the peace and serenity of a private home. Though, Mexicans love a good party and a few fireworks, so Sayulita is not always a quiet, tranquil place - ;-) There are also neighborhood roosters and ChaChalaca birds who make noise at times, just to be aware. This elegant modern colonial features a ceramic tiled kitchen and bathroom with a beautiful walk-in tiled shower and a comfortable wide loggia (porch) with traditional Mexican ambiance that overlooks gardens and valley. The dramatic rooftop area with palapa (thatched) roof and traditional equipale furniture provides a wonderful spot in which to relax and take in the 360-degree view above the tree tops with long vistas and a glimpse of ocean waves. The landscaped garden features a private outdoor shower (in addition to the one in the bathroom) to wash off the ocean salt as well as a large Mexican Cantera stone fountain. The casita features a shared and shaded walk up from the street which puts the home among the trees and birds. There is no need for a car; everything is literally steps away. Casita Limon offers everything you'll need for a memorable Sayulita experience: comfort, convenience, lush surroundings and the experience of living in a true neighborhood. Come to surf, sun, hike, swim, shop in wonderful local stores, ride horseback and experience the wonderful cuisine and ambiance of a small Mexican town. Sayulita is a special place; we think Casita Limon is too. Please contact us via the form with any questions and to arrange your stay. Casita Limón es un hermoso lugar, la atención de Maria y de todos los que nos apoyaron fue excelente y muy cálida. Seguro volveremos para disfrutar más de Casita Limón. Casita Limón está muy bien ubicada, cerca de restaurantes y cafés, a 2 cuadras de la playa, en la mejor zona . Really stylish apartment located conveniently just off the center of town making it easy to walk to everything while still being tucked away. We also appreciated the communication during our stay while still giving us our time/privacy. Highly recommended. They are super hospitable but also give you privacy. It was a beautiful place to stay in Sayulita and offered all of the little you might need, even beach chairs and and umbrella. Will certainly visit again! We had a fantastic stay at this place! The apartment is stylish, cozy, and comfortable. The rooftop patio and the beautiful fountain out front were highlights. 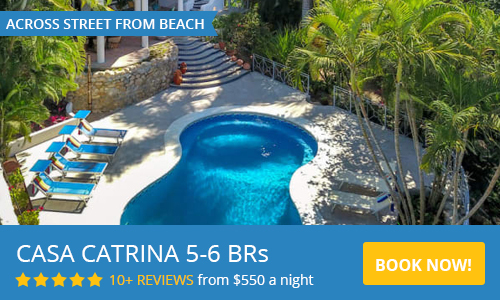 The location of the apartment is great, blocks away from the Sayulita Plaza, the main beach stretch, and a short walk to Playa de los Muertos. Thank you Maria for a wonderful stay, we would love to return! I would stay here again in a heartbeat! The place was super comfy and equipped with everything you need to prepare meals and make it your own. Minutes away from the town center which was great because things are close but it gives you a chance to get away from the noise, (except for the roosters, which you eventually get use to.) Maria and her family were on vacation but the property manager was great and took good care of us. Cosy and private , the 60 stairs are worth the privacy and view . There was noisy construction next door but that's pretty much whats going on everywhere right now in Sayulita . Lighting and decor is pretty much standard . The fridge temperature could not be lowered and items were freezing . The modem for WIFI is not in the casita and someone unplugged it , I had to wait overnight to ask the neighbour to plug it back in in the morning . Its pretty slow speed and have experienced faster and stronger in previous Sayulita stays . Bottom line the Casita is still good value and would recommend it . Paul, thanks so very much for your thoughtful reply. We appreciate the feedback; we are having the refrigerator repaired and will be shopping soon for more mirrors. We so glad that you enjoyed the house and its proximity to town. Best Regards! Update: the glass in the antique mirror has been replaced and we have a new refrigerator. We really appreciate feedback like this as we don't always know when something needs replacing! Love Casita Limon! Cute private setting with authentic Mexican decor. Relaxing patio with fountain and roof top deck area. Close to town and beach. Wonderful experience and highly recommend this property as we have stayed here several times. Great value too!!! The residents of Sayulita remain warm and hospitable despite the rapid development and influx of tourists which have strained (overwhelmed) the village's infrastructure (water treatment/supply/sanitation disposal) in the five years since we last spent time there. The beaches ~ North Beach, Playa de los Muertos, Playa Carricitos are still lovely places to visit and spend a leisurely day at. The jungle countryside and waves are as beautiful and alluring as ever. Along with its delightful lime paletas, the Wakika Halederia offers a sublime cappuccino paleta. The main Sayulita Beach is an overcrowded 'scene' of too much merchandising and too many people. 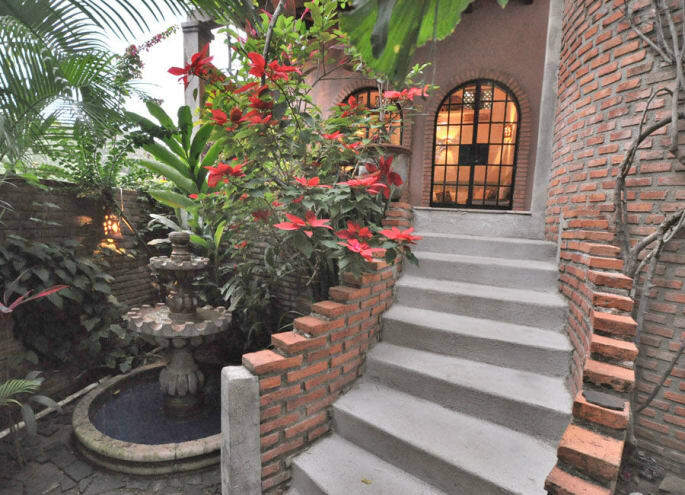 The images below which appear on the Sayulita Life site featuring Casita Limón are dated. Neither of these appealing views currently exist from the vantage point where there were once taken. A rather lavish casa now crowds up against the casita to the immediate south. "The dramatic rooftop area with palapa (thatched) roof... provides a wonderful spot in which to relax and take in the 360-degree view above the tree tops with long vistas and a glimpse of ocean waves." The view south to the ocean is blocked by the neighbouring casa. You do however have a nice view of that casa's nicely appointed rooftop patio and anything its occupants happen to be doing, or not doing. A plumbing problem (toilet line leak) developed while we were there. Reported it to the property manager (on the weekend), nothing was done to address it for the last few days we were there. "...you will enjoy the peace and serenity of a private home." Unfortunately, that 'peace and serenity' was limited to the hours between 3:00 am and 8:30 am, as the disturbingly loud techno-electronica music issuing forth from a few bars skirting el zócalo (village square) provide a continuous audio assault from later in the evening until the wee hours. And during the day, from sunrise to sunset, construction on a major condo project just to the north of Casita Limon provided a steady racket of industrial cement mixers and assorted power tools. Neither the next door construction project, or the late night party central noise was mentioned by the owners. Not so much misleading advertising, but certainly a sin of omission. They could have done the right thing and mentioned the daytime construction and late night noise pollution. And, offered a discount in their rates to compensate for the far from advertised 'peaceful and serene' conditions. I'm very sorry to hear that your stay did not meet your expectations and that we did not have more opportunity to address your concerns. Our guests' happiness and satisfaction is very important to us. The time period of the visit was Semana Santa / Holy Week and Spring Break. The beaches at that time are indeed extremely crowded and the nightclubs noisy as besides numerous foreign visitors, large numbers of Mexican nationals visit Mexico's beaches. Picturesque, comfortable, great for birders! My husband and I stayed at the picturesque Casita Limon and had a wonderful stay. As amateur bird watchers, we were thrilled to see so many interesting birds just walking around town, down sleepy dirt roads and along the beaches and rivers. We enjoyed the two local beaches. The busy and lively main beach is better suited for body surfing or surfing a paddle board (many rentals available) while the smaller, quiet beach just south of town proved to be a great swimming cove. Sayulita is filled with wonderful, inexpensive, delicious and casual dining experiences, but we also made many excellent meals in the well-appointed kitchenette. With multiple, fresh food markets and even a small organic market just blocks away, we couldn’t resist creating our own Mexican tapas and other delicacies. Heading up to the roof-top palapa with our tasty meals and beers in hand we enjoyed relaxing, taking in the expansive view of the town and surrounding hills, and watching the warm hues of the setting sun. If you enjoy reasonable rates, lovely accommodations (full of nice decorative touches and equipped with both indoor and outdoor showers), sunny blue skies, sandy beaches, delicious food, ocean swimming, and bird watching, this place is for you! I've stayed there twice. in the past two years. It's authentic, safe, clean, adorable and accessible. While the steps look daunting at first, the view is worth the climb. We found the managers to be responsive. 50% non-refundable** deposit due at time of booking, Balance due two weeks prior to arrival. No Smoking Please (includes entire property; sorry, no exceptions) and Pet Friendly with Permission. Four-night Minimum Stay. Check-in: 4pm; Check-out: 11am. **Deposit will be refunded if dates are re-rented. Long-Term rental available, Summer only. Meet the Owners Series: Jim Starkey and Maria Zache Starkey (Casita Limon)By: Stacey ElkinsWill you please tell us your name and a little bit about yourself?We are Jim Starkey and Maria Zache Starkey (owners of vacation rental, Casita Limon). We have been together for 24 years, married for nine, and met at a punk bar. Jim was a photographer, journalist and director for a good-sized newspaper in the U.S. and has been a fine artist (oil paintings) all of his life. Jim paints many scenes of Sayulita and his work can currently be seen at Libreria Sayulita on Miramar. Maria worked for many years at fine art galleries before finally working in her degree field of political science (urban planning) as part of a community organizing team at a neighborhood association in an historic district, our former neighborhood. We did a massive down-sizing two + years ago and now live in a downtown condominium in an 1875 brick building. We drive each winter from the Midwestern United States with two cats and a dog (who Sara from SayulitAnimals matched us with) about 3,200 miles. We love seeing the sights in Mexico and the U.S. along the way and feel that traveling by car through the many ecosystems is a much more human method of making the transition each year. We have both done volunteer work with and for the amazing Sayulita organizations Pro Sayulita and SayulitAnimals, as well as work with Sayulita Life and Sayulita Magazine. The past two winters Maria has also helped to make mattresses for local, indigenous children from plastic grocery bags; this is an amazing project started in Sayulita by the tireless efforts of Carolina and Fernando Lazaro.What is it about Sayulita that made you want to buy a vacation rental here and how long after your first visit to Sayulita did you purchase your house/lot?We always had in the back of our minds that we would “retire” somewhere warm and had thought for quite some time that would be in the Caribbean. Slowly it dawned on us that we could drive to Mexico and that Mexico offered way more culture than just about anywhere. Sayulita has that unquantifiable “thing.” During our first visit in April of 2005, Jim met Barry DuMont of Galeria Gypsy on Marlin. Barry really liked Jim’s artwork and suggested that we come back for a show at the store. We did so in December of that year and both started looking at property online. It was not our intent to buy; it just seemed so right. Barry suggested we look at property with Israel Preciado and we Fruit Truck in the plaza painting by Jim Starkeyended up being Israel’s first real estate sale when we purchased Casita Limon. “Back in the day,” it was: Visit Sayulita / Buy Land. Then it became: Visit Sayulita / Buy a House. There are many, many stories around town from foreign owners (many of whom are now our friends) who purchased after their first or second visit to Sayulita. What is it about Sayulita? The people, the dogs, the roosters, the dirt and cobblestoned streets, the immediacy of life being lived, the beach, the ocean, the hills, the jungle, the food, the culture – we liked everything about Sayulita. There was also the comfort of the foreign community and being neighbors with like souls. I’m sure that over time, the influx of foreign owners has been at times challenging for the long-time national residents; this community has certainly changed Sayulita and not all change is good.Did you build or remodel your home? If so, please tell us one of the classic "you won't believe this" stories.We have added a second floor to our Sayulita home and several years later, added another room to the new floor. (Our house is now a duplex and we live on the second floor when in Sayulita.) Working with the Mexican architect and craftsmen was a delight, but we encountered a surprise when we first went to obtain the building permit. "Your property is too small to build a home on". What? Our house is already there! When our property was divided and the first building completed, the minimum lot size was smaller. They did give us the new permit and in effect, “grandfathered” our house in.How long have you owned your home in Sayulita?We bought our home in 2005.Can you share with us some of the changes you have seen around town?Sayulita is cleaner, busier and more comfortable. Within one hundred yards of our home there are more than a dozen new structures. Because our neighborhood is hilly, it doesn't seem crowded. The beach is way busier. There used to be only one chair rental; now they cover much of the main beach.What in particular made you decide on this house rather than other listings available at the time?We loved the traditional architecture, the location, and an affordable price. Israel took us to see some other lots and we both kept saying: “What about that small brick house?” We hadn’t realized that the other had been looking at the same house online! Maria likes to joke that we would not have had the opportunity to buy our house had the real estate photos been better. They were taken in the middle of the afternoon and made the house look very hot when it is really much more like an oasis. Another couple (who had stayed at the very same Sayulita vacation rental unit right before us, coincidentally) hemmed and hawed too long about whether this was the right decision / investment for them. Maria can remember lying under the Christmas tree that December looking up at the lights and ornaments, after our offer had been accepted and we had made the non-refundable deposit. Jim asked: “Are we doing the right thing?” Maria answered: “Do you ever really know? You just follow your heart and go.” We’ve heard many similar stories from homeowners in Sayulita.How would you describe the neighborhood your vacation rental is in?Our neighbors are divided equally between established Mexican households, rental properties owned by foreigners who visit occasionally, and owner-occupied rentals.Who is the most interesting guest you have hosted at your home?We had a delightful several-time renter who rescued an opossum that some workmen had thrown into the street. She took the animal and gave it a Reiki treatment. The grateful animal revived and went on his way.What are your favorite things to recommend your guests do while in Sayulita?Everyday things take on more enjoyment. A walk through town, sitting in the square, a trip to the store, an afternoon at the beach or dinner on a street-side table can all be an adventure.What do you feel sets your house apart from other vacation rentals in Sayulita?Although our casita is a short walk to the square and the beach, it is in a quiet and private setting. Many guests appreciate the traditional Mexican architecture, the lush garden and fountain, and that we’ve kept the modern conveniences to a minimum. We do offer wifi, but not TV or telephone, providing a true chance to unplug, if so desired.What advice do you have for someone searching for a home/land in Sayulita?Look for property or homes that aren't automobile or golf cart dependent. This is a walkable town. Enjoy it. Don't add to the congestion and spend your time and energy finding a place to park. Follow your heart.Encore Story Published about owner Jim Starkey:AFTER A CELEBRATED CAREER AS A PHOTOJOURNALIST, THIS ENCORE RETURNED TO HIS FIRST LOVE -- PAINTINGAs a youngster, Jim Starkey’s father was as apt to ask him not only “What happened in school today?,” but also “So, do you think you’ll ever amount to much?”He chuckles good-naturedly. “I don’t know if I have,” he answers, “but that idea of being worthwhile has always stuck and I don’t mean financially.”Meet a guy who earned his first dollar working as a pre-teen in a carnival and lost his mother at 17 and his father just five years later.By then, Jim was already an old hand at the newspaper business, as he started shooting photos as a “stringer” for his hometown newspaper in Downer’s Grove, Illinois while still in high school.But even as he completed a journalism degree at the University of Missouri and went to work at a career that spanned 37 years at The Grand Rapids Press (The Press), Jim kept one hand on the artist’s palette, leaning on classes he had taken not only through community education programs, but at the esteemed Art Institute of Chicago.He and his photo staff won awards during the 1970s and 1980s that garnered The Press national attention on numerous occasions. And these days, he still loves shooting black and white images that capture people and their personalities.What he’s accelerated since retiring from The Press in 2007, though, is his art – vibrant paintings that capture the work and whimsy of everyday people both here in Michigan and in the Mexican village of Sayulita, where he and wife Maria own a year-round casita.“When I was little, I made a lot of art on my own. I remember getting copies of “Arizona Highways” and I would sketch those photos with pastels -- the cacti and the sunsets and the highways.”As he matured, Jim realized that “I wasn’t enough of a go-getter to make a living at art…so I became a photographer.”During news meetings, he remembers “making little scales where I would grade places on their scenery, the food, how easy it was to get there and are the girls pretty. And after my first time to Sayulita, its score always ended up higher than anywhere else.”A bit of a maverick even at an early age, Jim appreciated a paint-by-number set given to him by his grandparents, but he ignored the number scheme in favor of laying in his own colors wherever he wanted.That technique persisted some, as his paintings reflect intense color, contrast and texture.While he and Maria winter in their Mexican haven, they also keep a place above the old Peck’s drugstore building in Grand Rapids at the northeast corner of Monroe Center and N. Division Avenue. They live above Jim’s studio, which doubles as a gallery he shares with other artists – a lively scene where passersby can watch artists in action while pondering a purchase or discussing a commissioned work.“Have you ever been to an art gallery where people are working?” Jim asks. “There aren’t a lot of places like that. And we really enjoy talking to people; we’re even a little giddy about it.”Of course, given the fact they’re located in the hub of downtown Grand Rapids, not everyone stops in for the sake of art.Every now and then, says Jim, someone comes in and asks, “Say, do you have some quarters for the meter?”ABOUT ENCOREEncore is a burgeoning national movement created to tap the skills and experience of those in midlife and beyond to improve communities and the world. Encore sets out to define this new stage of life. An Encore can combine work, service and social impact.Grand Rapids Community Foundation’s Encore is leading the way in Kent County by seeking to inspire individuals in their 50s and beyond to engage in meaningful work and service that makes a difference. In addition, we seek to challenge organizations in our community to pave the way and increase their capacity for experienced talent by identifying innovative pathways and opportunities for service.